﻿ Saint-Petersburg for travellers. St.Petersburg seasons - Spring. As the snows melt and the first blossoms peep from St. Petersburg's many beautiful parks, the City casts off its winter mantle and embraces the spring sunlight. 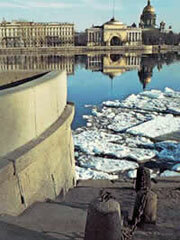 The last of the winter ice flows dramatically down the Neva and out to sea. The haunting notes of St. Petersburg's street musicians can again be heard as the days grow ever longer and the City of the Tsars is filled with a vibrant sense of re-birth. Spring is an ideal time to visit The Hermitage - the magnificent former residence of the Tsars and home to one of the world's greatest art collections. Ahead of the summer crowds, you can gaze in relative privacy at works of art by a multitude of famous artists from Rubens to Van Gogh. Immerse yourself in the intrigue of pre-revolutionary Russia with a visit to Yusopov Palace, home to the once mighty Yusopov family and site of Rasputin's infamous murder. Or take a trip into the countryside and visit Paul's Palace at Pavlovsk - one of the finest examples of restoration work in Russia. After viewing the treasures of the Palace, enjoy the spring sunshine in the picturesque landscaped gardens which surround it.